A second memorial to the same casualties is inside St Edward’s Church. 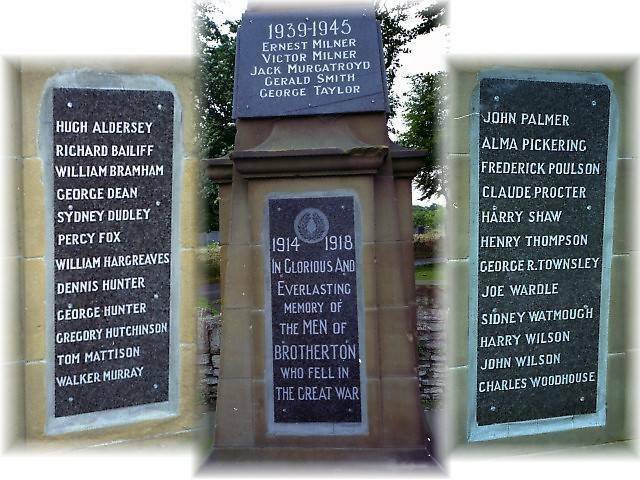 Also Captain Aldersey is recorded in his home village on the Aldersey War Memorial. Son of Mrs R Jolliffe of Marsh House. Mrs Jolliffe was born Charlotte Midgley. She was, from 1908, the wife of Richard Jolliffe and had previously been married to Tom Dean (who died 1906). She had 9 children at the time of the 1901 Census of Fairburn. George and several siblings were born at Shadwell. son of Charles & Eliza? This soldier from the Royal Army Service Corps died in Aalst but is not recorded at Brotherton. One possible explanation is that he was the Ernest Wilson of Bradford who married a Lilian Hargrave(s) in Bradford in 1933. This Lilian could well have been the one born in Brotherton in 1913 and who then returned to her family after the death of her husband.